We have great news for Eversource customers. This Offer Won't Last Long. Prices May Change. Cancel Any Time! A Perfect Winter Electric Rate! Your new residential supply rate will be fixed at 10.49¢/kWh for 6 monthly bill cycles and will automatically move to 12.49¢/kWh fixed for 14 monthly bill cycles for a total term of 20 monthly bill cycles. After that, rates may vary based on your terms of service. *comparing electric supply-rates only. This does not include the charges from the utility to deliver power to your home. 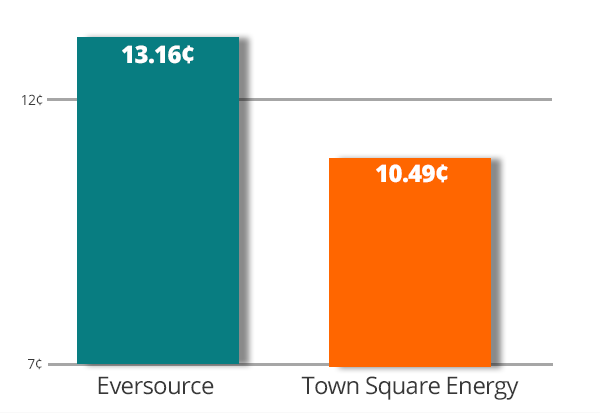 Comparison based on the current standard residential service supply-rate offered by Eversource of 13.16¢/kWh. This supply-rate offer is for Eversource customers living in Massachusetts. Once you submit your enrollment we will send that information securely to your utility to inform them that you are now purchasing your electric supply from Town Square Energy. Depending on where you are at in your meter-read cycle, you will see Town Square Energy and your new supply-rate on your utility bill. The electric supply-rate offer from Town Square Energy listed above, comes with free enrollment, no additional service fees, and the customer may cancel or switch their supply-rate plan at any time without penalty or fees. We will also send you confirmation of your new electric rate and the full terms of your plan to both the e-mail you provide and a welcome letter to your service address. All additional details for the electric-supply plan you choose will be listed in your terms of service. We are always available to provide updates regarding your account. We also send important account alerts to your e-mail on file and through the mail. We also send all required terms as required by your state’s regulatory requirements for 3rd party electricity suppliers.